It seems like every game that Pens commentators Paul Steigerwald and Bob Errey are making a reference to the "two-headed monster" of Crosby and Malkin, but is it time to add another head? Ok, so lets not get carried away but Mark Letestu has been playing at the caliber of Sid and Geno for the last few games and this one was no different. Letestu lead the way with the game's first goal as well as an assist and was elected as the game's first star. How about the "two-headed monster"? 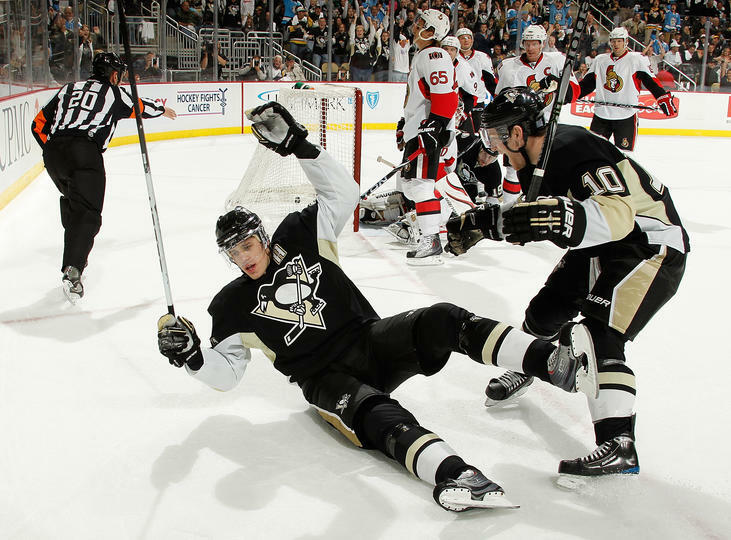 Ironically, Sid and Geno both contributed a goal and an assist each and put the Pens up 3-0 at the first intermission. Letestu's goal started things off on the right foot when Mark shot a laser past Brian Elliott on the powerplay to put the Pens on the better end of the scoreboard. Crosby continued the momentum when he stuffed in a rebound, which was also on the powerplay. Malkin's goal may have been one of the best of the year, as Geno tracked the puck perfectly after a botched faceoff by Jason Spezza and then dove to the ground while lifting the puck over Elliott and into the twine. Daniel Alfredsson tried to put the Sens back into the game with a powerplay goal early in the 2nd, but the Pens put that notion to rest a bit later in the period with goals from Pascal Dupuis and Kris Letang that were just 25 seconds apart. Chris Campoli would score later in the 3rd to cut the lead to 3, but Johnson made sure that it got no closer. There are a few interesting things to note about this game. Deryk Engelland had another fight, this one with Chris Neil, that went the distance and had no clear winner. Neil was not done with his usual shenanigans, and received a misconduct later in the game for a scuffle involving Ben Lovejoy. Mike Rupp also dropped the gloves with Matt Carkner. There was really no need to change the game because Letestu got it off to a great start with his goal in the 1st. Offense- A Put up a 5 spot midway through the 2nd and then all they needed to do was coast the rest of the way. I'd call that a success. Defense- A- Another really solid performance. Also it must be noted that the defensemen are becoming a key part of the offense, starting and joining rushes as well as putting shots on the net. Johnson- B+ Another 30+ save day and now he's 4-0. He must really not like having to sit and watch Fleury play. Powerplay- A- Wow, they looked spectacular today. An improvement from Saturday and a total 360 from Friday. So the pieces are in place, it's just a matter of consistency. Penalty Kill- B- Ok, so they gave up 1 goal but still weren't bad overall. -So the Pens took my advice (though I'm sure I wasn't the only one giving it) in going after our old friend Sarge. He did tally up a point on Alfredsson's PP goal, but was on the ice for every single one of the Pens' goals and finished -3. -Interesting situation forming on defense. With Orpik's return possibly pretty soon and Michalek also not too far off, the question arises as to who will sit out. Hutchinson will go back to WBS, but the 6th spot will be a contest between Lovejoy and Engelland. Lovejoy was the clear favorite for the job when the season began and he has been very solid, but Deryk has been equally solid and has also contributed to the team with his physical play and underrated fighting ability. It's a good problem to have, but nonetheless still a tough decision on the horizon for HCDB. -Anyone saying that Sid and Geno aren't the best dual threat in hockey has obviously never watched it before. Combine this with a 3rd line on a mission and deceptively talented 4th and you have one of the most potent attacks in the NHL.